If one happens to look up the Socialist Alliance on Wikipedia, one will find several entries under the tag of ideology. According to Wikipedia, the ideology of the Socialist Alliance includes “socialism”, “anti-captialism”, “far left”, “ecosocialism” and “environmentalism”. I certainly have no objection to the the first three, and the last one. But ecosocialism? 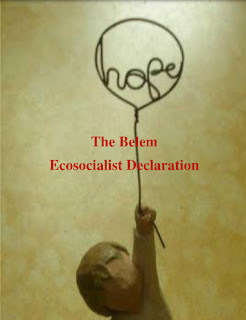 How did ecosocialism come to form a part of our ideology? Comrades Sam Bullock and Adam Baker have advanced an argument for the Socialist Alliance to amend some of our public documents or whatever to say that we are an ecosocialist organisation would amount to some sort of watering down or weakening of our politics.I don’t agree with Sam and Adam – and will proceed to outline why – but I think it is good that they have made their views on this question known.